In November 2015, Regina Vega entered The Silvercrest Center to start her road to recovery, a journey that happily and remarkably ended with her home as a Silvercrest outpatient. This was extraordinary because in September of that year, Ms. Vega had been hospitalized with cardiac arrest. In the ICU her lungs had accumulated a dangerous amount of water and she was placed on a ventilator as a form of life support. Ms. Vega had long battled multiple conditions, including epilepsy, which had resulted in her fragile state. “In the hospital, the doctor said that her chances of recovery were very slim,” says Lorenzo Vega, her husband. She was saved when he doctors drained her lungs and placed her on a ventilator. Once stabilized, she was discharged to Silvercrest. 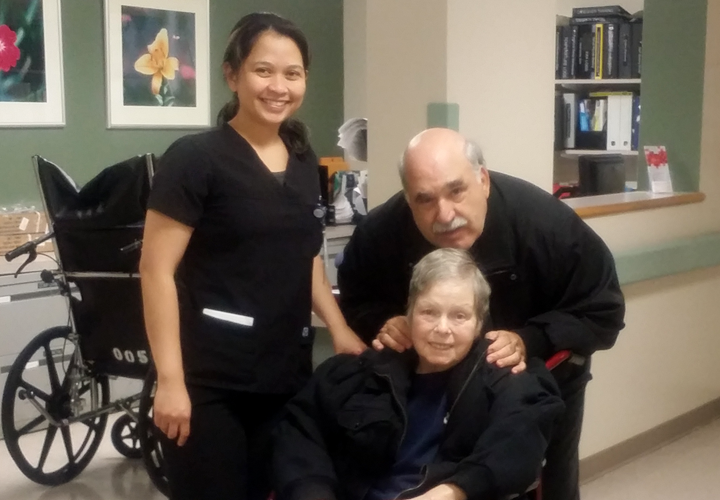 “The pulmonary and rehabilitation team at Silvercrest are the best there is,” said Mr. Vega. “The team immediately formed a care plan and started the rehabilitation progress.” Within two months of entering Silvercrest, Ms. Vega was completely weaned off of the ventilator and was able to ambulate without assistance for 40 minutes consecutively. In addition, Ms. Vega gained back function in all areas of her activities of daily living and was able to conduct most daily tasks on her own.